Twin Donuts, a 1950s-era landmark and long-serving restaurant in Allston’s Union Square, will undergo a major facelift this spring, compliments of renowned Boston developer Harold Brown. Brown's company, The Hamilton Co., purchased the 3,212-square-foot property at 501 Cambridge St. for $250,000 in 1985, and now plans to spend about $200,000 to renovate the building. The project is expected to include a new 1950s-period facade. “The property is a gateway to Union Square and it’s the first thing people see when they come to Allston,” said Brown, Hamilton’s chairman and CEO. 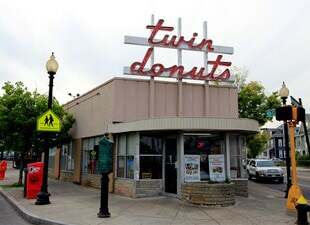 “The Twin Donuts sign has become an icon in the neighborhood, like the Citgo sign in Kenmore Square, and we think it's time for some improvements." Samara Tilkin, the architect on the project, said the restoration is being done to coincide with Hamilton Co.’ s 60th anniversary this year. The doughnut shop will remain open during the renovation, which is expected to start next month and will take six weeks to complete. Brown, 89, has long had a soft-spot for doughnuts. Before he founded his real estate company, Brown was the owner/operator of three doughnut shops in Greater Boston in the 1940s including one in Cambridge's Central Square Cambridge, Somerville's Davis Square and another in Illinois. Brown sold the properties, then known as “Brown’s Food Shops,” when he was called into military service during the Korean conflict. The shop is leased from Hamilton and operated by Sou Pang, who bought the business from the previous owners with her late husband in 2001.